Angkor Wat commands, but Sukhothai floats. Its central shrine, Wat Mahathat, isn’t big enough to dominate the perspective as you walk around the area. More than 150 other shrines spread around the center, so as you walk around Wat Mahathat, the perspective expands through a landscape full of enchantments. The Buddha rules benevolently. He doesn’t force your gaze onto one building. He lets it meander through a world of delicate forms. This is one of two mandapas with a standing Buddha–one’s just north and the other was built just south of the central stupa. 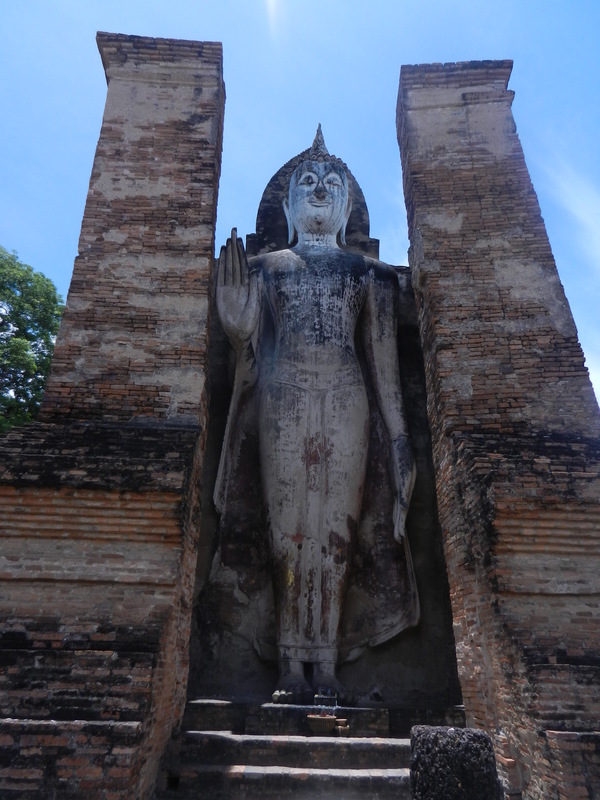 Pagan had already built square mandapas that housed statues, but Sukhothai made them narrow. The smiling oval face and sinuously curving body project a benevolent attitude. 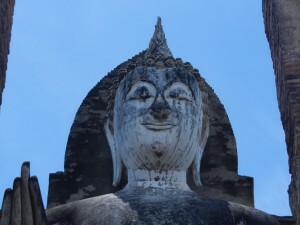 These soft forms complement the temples, and they’re common features of the Sukhothai Buddha. 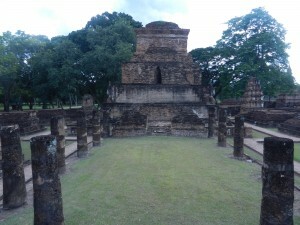 The above complex, at the southern end of Wat Mahathat, is its second largest structure. An inscription says that it was built in 1384 by the teacher of King Mahathammaracha I (who reigned in the mid 14th century, after King Lo Thai, who reconstructed the central shrine) to house his relics. On the left, you can see remains of 2 narrow halls. The one on the far left might have been an outdoor pavilion, and the other was walled. 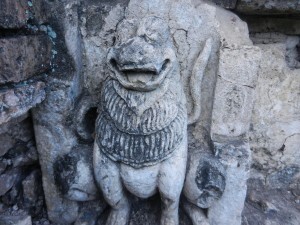 Both provided a stately entrance to the stupa. 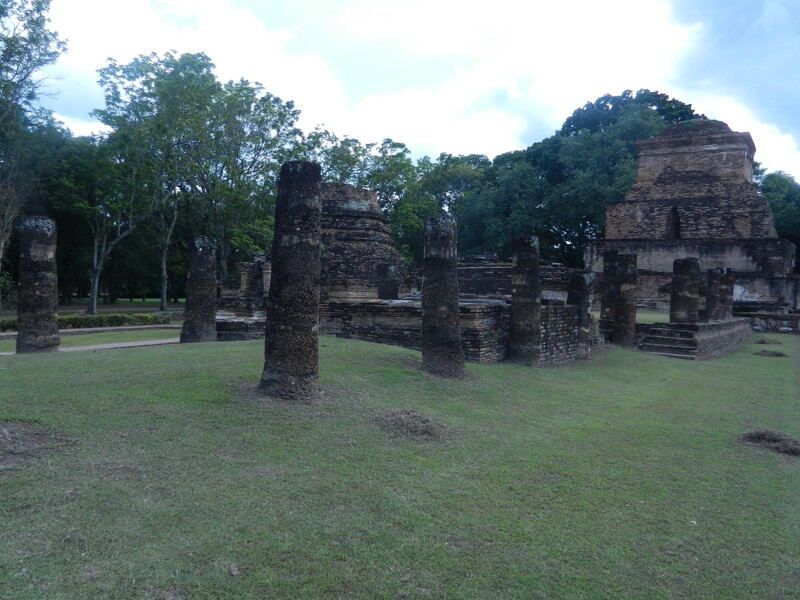 Here, we see the stupa from the inner hall. Its name is Ha Yot, which means five spired stupa. The top collapsed and the spires are gone now, but the stupa is still well worth lingering over. A Sukhothai-style Buddha is on the north, west and south sides of the stupa. His supernal grace is balanced by lots of lively creatures that line the bottom of the building. Some are elegant and humanized. There’s also this lion keeping the riffraff away. Other creatures are fanciful. Elephants, dwarfs and demons share real estate with them. 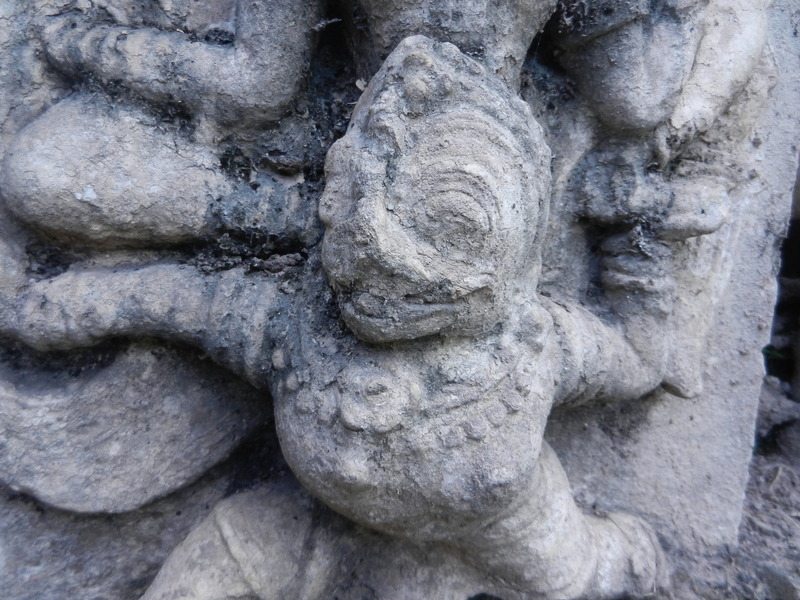 All comprise the realm of earthly existence in Buddhist cosmology. 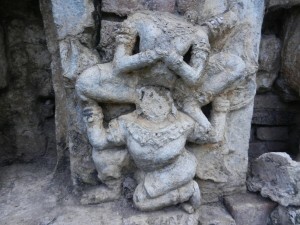 Though it’s the zone we’re all supposed to strive for liberation from, these figures were carved with a sense of fun which makes me want to hang around for a while. 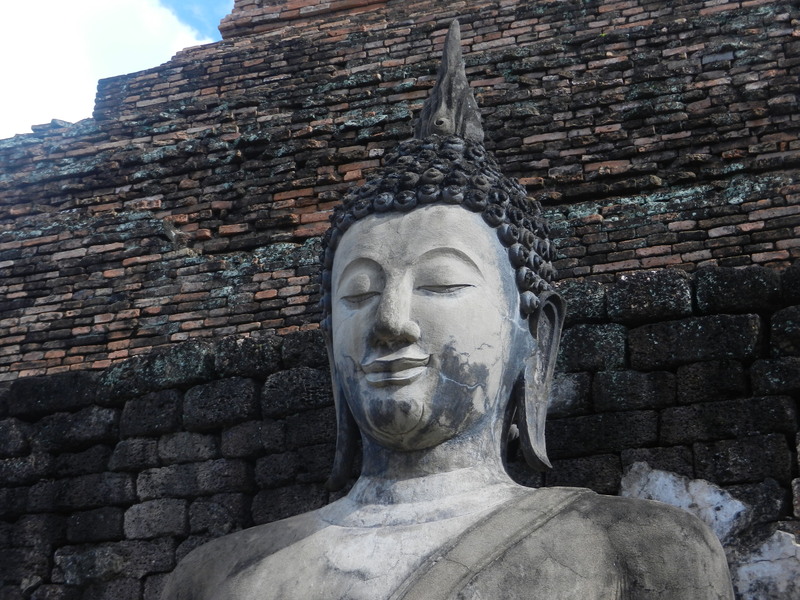 Very Thai–hope for a better rebirth, but have fun along the way. So though the Buddha and the king have prominent places at Wat Mahathat, they rule it softly. You around them at your leisure. There are still more than 150 other buildings at this wat, and this is where the magic really happens. We’ll explore it in the next post on Sukhothai.